Home » Anime/Manga » Nausicaa and the Valley of the Wind Review! Nausicaa and the Valley of the Wind Review! Written by: JediJondee46 on September 24, 2017. This caps off the Studio Ghibli Fest for me, the last film I didn’t see in theaters, and it is a highlight because it is an adaptation by Hayao Miyazaki based on his manga. 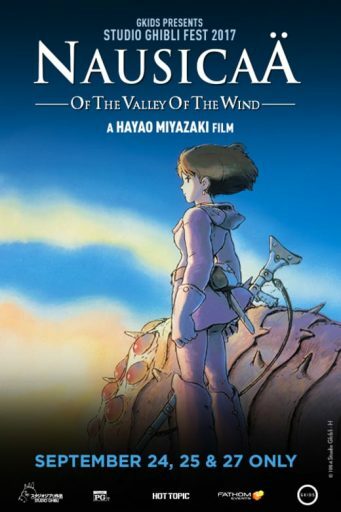 There is something incredibly personal to Miyazaki-san and this film also contains many of the themes that show up in his Studio Ghibli movies. It is one of the few post-apocalyptic movies that actually has a point. The premise is not the world as gone to hell and all you can do is survive (which seems to be all that the post-apocalyptic movies like Mad Max: Fury Road can bring), instead there is something deeper about sacrifice, the Earth, and man’s part in all of it. The film begins in the Toxic Jungle, a seemingly ravaged world that is something far beyond Dagobah or the swamp in Dark Crystal. It is a place that is dangerous and yet surprisingly beautiful. Riding through it is a mysterious figure riding a Horseclaw, blue-feathered, large bird mounts which reminds me a bit of the prehistoric Terror Birds. He can see a house ruined by the poisonous forest. We switch then to the blue skies where a girl is riding a long winged Mehve, a glider with an engine, this is Nausicaa. Her name has an origin in The Odyssey as a princess that helps Odysseus to get a ship to finally take him home. Lord Yupa returns to the Valley of the Wind which has many windmills churning to keep out the toxins from the poisonous jungle. It is really the wind from the sea that blows away the poisons. There are not many people left on this world except the pastoral valley and a few others. Yupa sees that Nausicaa has returned and is busy patching up a windmill sail. This practicality, hard work, and scientific mind that is kind, while also having the strength to be a warrior, but choosing not to fight, makes Nausicaa my favorite princess, Disney, Themyscira or any other place or time. She was helping out Mito, an older warrior who has an eyepatch and is her retainer. He is voiced by Edward James Olmos. Nausicaa’s father, King Jihl (Mark Silverman), is bedridden with an illness. Later, he emerges from the bed wielding a sword, his strength as a kind ruler is seen there! The interesting part is the old blind woman, Obaba, voice vet Tress MacNeille voices her. She is the voice of wisdom and belief in a prophecy that a man in blue will walk a golden field to save everyone. Nausicaa is later on the roof observing an airship, a long winged transport like a Steampunk nightmare, about to crash. Nausicaa takes her Mehve to try to help guide the airship, but it clips the canyon wall and crashes down to the valley to explode. The airship is from Tolmeika, an aggressive nation, and the only survivor is a prisoner, Lastelle (Emily Bauer), from another country, Pejite. She tells Nausicaa to destroy the ship’s cargo before passing. The cargo happens to be an embryonic form of a Giant Warrior, the giant, shadowy forms that ravaged the world in the Seven Days of Fire. The Ohmu were swarming on the airship and one survives the crash. Nausicaa uses her charm to calm it and lead it back to the Toxic Jungle. The Tomeikan gun ships land to occupy the Valley of the Wind. Their leader is Princess Kushana, who is Furiosa if she was the leader of an army. Kurshana is voiced by Uma Thurman who makes her complex, but driven. As a princess, she is the dark reflection of Nausicaa, a possible path she might fall in. Her second-in-command is Kurotawa (Chris Sarandon), an aristocratic military leader, who is easily defeated by Nausicaa. She also goes into a rage when her father is killed and takes down several soldiers until stopped by Yupa, her blade sinks into his arm. His blood shocks Nausicaa and makes her regret her rage. She calms down her people and becomes a hostage taken back to the Tolmeikan capital by Kushana. The Tolmeikan gunships are attacked by a Pejite interceptor with a young pilot. They are destroyed and the gunship with Kushana, Nausicaa, and the other hostages crash into the Toxic Jungle. The Pejite pilot is Asbel voiced by Shia Labeouf. This was early in his career just after leaving Disney. Nausicaa tries to save Asbel and they fall through the sand to the underground of the Toxic Jungle. Nausicaa has to somehow find out the plans of Tolmeik and Pejite especially the sinister plans of Mayor of Pejite voiced by Mark Hamill. Nausicaa is caught between these forces and must somehow find peace between all of them. The movie has an epic pace, there was some in the audience shifting and yawning, but it really pays off in terms of the animated grandeur and sweep of the story. Check Fathom Events for theaters and listings, September 25th is the subtitled showing, and September 27th is the dubbed version. Five Horseclaws out of Five!